The Ravens second Lombardi Trophy is tucked away in the castle, nestled upon other pieces of Ravens history. Looking back on it, that’s exactly what that magical 2012 season is now. It is history. For fanatics, it can certainly be an emotional roller coaster at times and we’re now spoiled knowing now how good life is at the top. National media spotlight, ticker tape parade, late night television appearances, reality TV stardom, championship ring ceremony, “America’s Game” tribute to the team (Which debuts in late August). They can’t take any of that away. But it’s now time to get back to work. Ask the other 31 teams if they care who won the Super Bowl last year. It’s time for everyone to focus on the here and now. The Ravens hit the practice fields for the first time today in full pads, full contact, and 90 men will fight for 53 spots on the 2013 roster. So many familiar faces around these parts have moved on. The coaches will have their hands full getting the handful of new players to gel with the returning ones. The pieces are there. Now it’s up to the coaches to utilize those pieces properly in building the foundation needed to defend a title, and enter the rarified air known as a dynasty. Something only a few teams in history can attach their names to. Dynasty is a pretty bold statement. If the Ravens and their fans want to start throwing the “D” word around, they’ll have to make some pretty bold statements on the field. We’ve talked about the players. We’ve talked rivalries. We’ve looked at positional battles. We’ve discussed expectations. Now it’s time to man up. Take expectations to another level. Make a bold statement. Here are a few bold predictions I’ll throw out there for 2013. Share your bold predictions on our message board. I think Jim Caldwell knows how to run an offense. 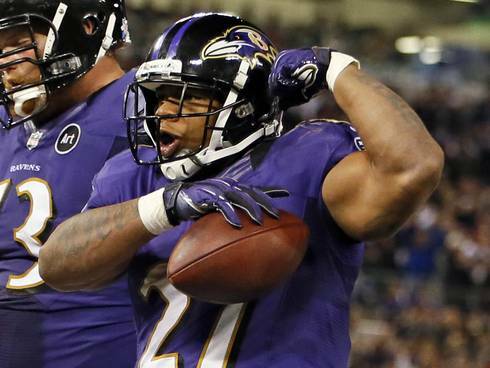 Gone are the days of Ray Rice getting single digit carries. Or being completely absent when the Ravens are playing with a late lead and trying to put the game away. Yes, Bernard Pierce will get some more carries as well. But Rice will also see more receptions with Anquan Boldin out of the mix. 1,250 yards on the ground, 750 yards in the receiving department is attainable. Rice has cracked to 2,000 yard plateau twice. 2,041 yards in 2009, and 2,068 yards in 2011. His numbers have gotten better and better each season. His hands are now the best on the team in my opinion. He’s Joe Flacco’s best bud on the team. Pitta should get a ton of looks in the red zone. If Pitta doesn’t emerge as a top receiver on this team, it would be very disappointing. Rookies in the secondary might as well wear signs that say “I’m new here! Throw the ball this way!” Elam is going to be tested often by opposing quarterbacks. He’s going to get his fair share of chances to make plays on the ball. Matt Elam could notch five, six, seven INTs because of this. Not to mention he’s a heavy hitter. I think we’ll see the first round pick make his fair share of bone crushing hits that will only boost his popularity. Christmas came early For Terrell Suggs when he found out that Elvis Dumervil was coming to Baltimore. This could go down as the top pass rushing duo in the league. Blockers can’t double up on one or the other. You have to have a helmet on each man at all times. That’ll free up the guys around them to make plays. Two of the better edge rushers in the league on the same team should be awfully fun to watch. We could see sack totals of 16 or 17 for Dumervil and 13 or 14 for Suggs to make 30. The defense as a whole should be top three in the NFL in sacks. Those are my bold predictions. What are yours?